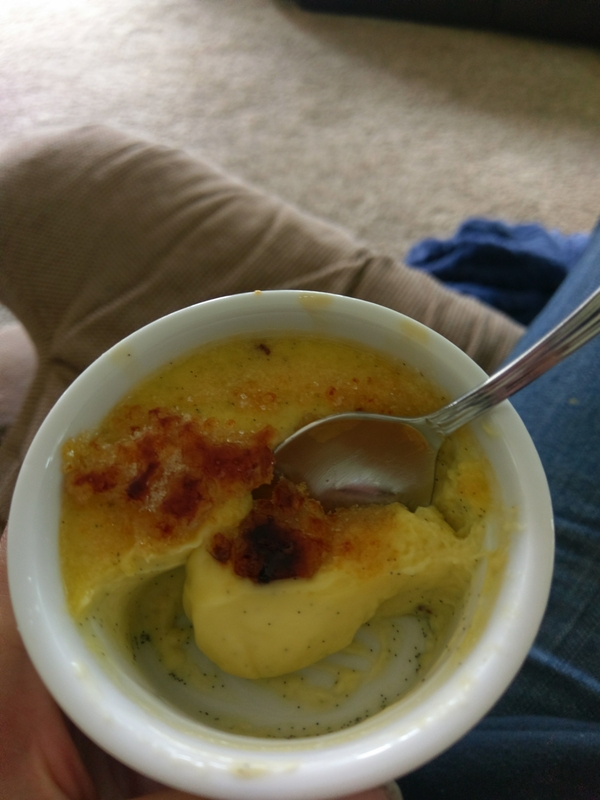 I recently took the dive and decided to make my “white whale” desert; creme brulee! I had always heard that it was a difficult desert to master and so I decided finally to stop being so scared and gave it a try, I mean really how hard could this be?! This dessert is by far my number one favorite dessert I eat it at every opportunity I get, restaurants, buffets, vacations…I’ll look for it on menus everytime we go out to eat. I have tried probably 7 different variations of creme brulee. I’m a little bit of a conesoire in this. the desert itself dates back to 1698. Which is pretty amazing the idea that a recipe can last that long and have so many different variations and they can still take it back to its origins. It is one of these simplest desserts affordable by many and used in households and restaurants alike all through the seventeenth through eighteenth centuries it continued to become popular in fancier restaurants into the 19th and 20th Centuries. It consists of four main ingredients egg yolks, sugar, heavy cream, and vanilla it’s topped with a burnt caramelized sugar that has been created in a number of different ways. Original recipes used to take the sugar and carmelize it separated from the desert and then used as a disc that would top it just before serving traditional methods now brulee the sugar on the top of the desert adhering it to the top so that the sugar must be cracked in order to access the creamy dessert below. For me there is nothing better than the sound of cracking that sugar I just know that it means there are great things to come, and with that I am excited to share with you my recipe for creme brulee enjoy! Preheat your oven to 350F. Premeasure all of your ingredients, get the water on the stove to boil. In a medium mixing bowl combine all of your ingredients except the boiling water stir well until the granulated sugar has dissolved completely. Fill 4 small ramekins with your mixture and place them into a 9×13 pan. Place the pan on the oven rack but don’t slide the rack into the oven just yet. Very carefully pour the boiling water into the 9×13 pan around the ramekins until 2/3 covered, but do not get the water into the mixture or it will ruin the custard. Carefully Slide the rack into the oven and bake at 350 degrees for 30 to 40 minutes or until the tops are lightly golden brown. Once baked remove each ramekin from the oven using tongues do not get the water into the custard and place them on a cooling rack for up to 2 hours or until cooled completely. Once cool to room temperature cover each Ramekin with plastic wrap and place into the refrigerator for at least 7 hours or overnight. Just before serving blot any liquid off of the top of each Ramekin, top with a teaspoon of granulated sugar. Using a kitchen torch brulee the sugar caramelizing it until it’s a dark brown color. Allow the sugar to cool and serve immediately! 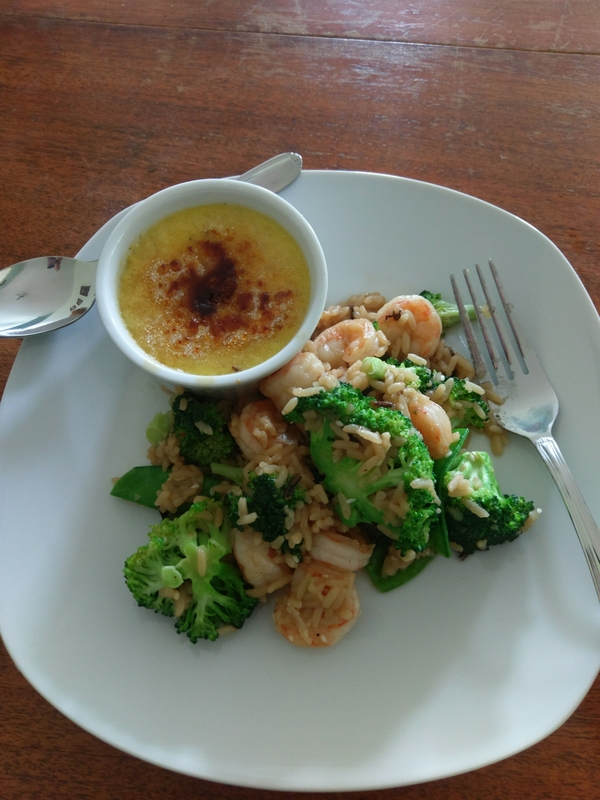 I was so excited that this recipe came out perfectly and that we were able to get the caramelization just right it really truly was an accomplishment for me in my culinary experiment here.I just might make more tonight lol! Thanks for reading! Next Entry More tabletop inspiration!